I was lucky enough to attend O’Reilly Bot Day in San Francisco. Bot Day was the first “proper” bot conference I’ve attended. I’ve hosted and/or attended many bot meetups here in NYC (join Botmakers if you’re interested), but the scale and the audience of Bot Day was very different than a meetup. As you can see, the presentations were ordered in a narrative, starting with a high-level overview of technology and market trends, diving into some core technologies, then platforms, toolkits, UX, a real-world example, and finally another high-level view of how bots are being adopted across cultures. 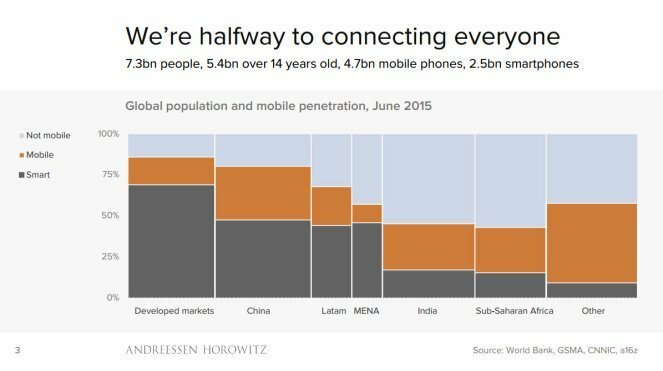 Ben Evans started off by looking at the mobile market, which is massive, with ~3.5 billion people owning mobile phones, meaning the market can grow by another 50%. 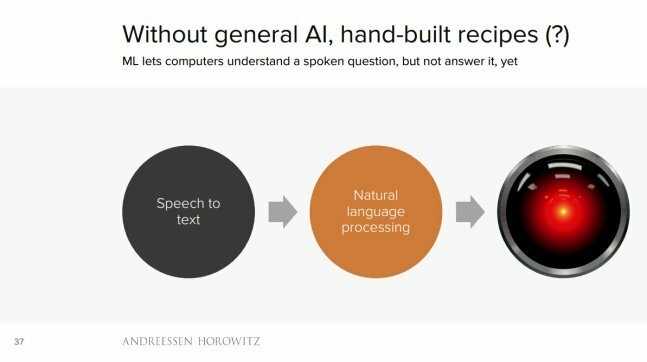 Yes, Watson beat Ken Jennings, and AlphaGo beat Lee Sedol, and Microsoft researchers just reached human parity in conversational language understanding. These are big deals. 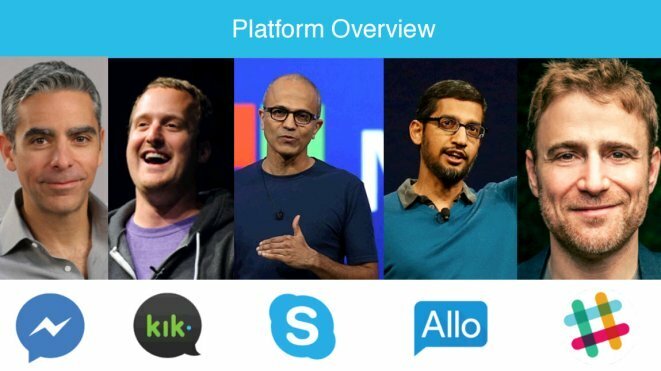 However, despite these achievements, we shouldn’t be expecting the “Assistants” being created by major players (Microsoft Cortana, Apple Siri, Google Assistant, Amazon Alexa) to be capable generalists anytime soon. Assistants can understand what you’re asking, but they don’t have the specific domain expertise to follow through with action. 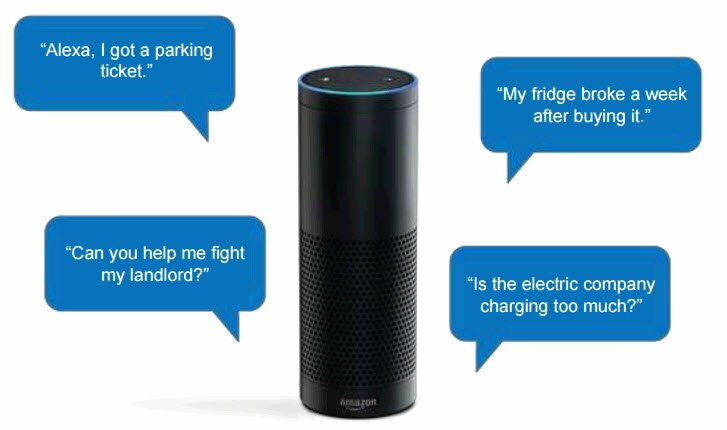 Individual bots will be the “last mile” of connection between the customer and the job-to-be-done. 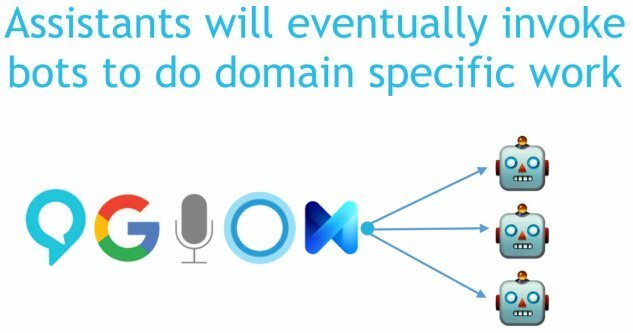 The customer may use an Assistant to get them to the bot that takes them the last mile, but individual bots will provide the domain-specific knowledge necessary to accomplish many valuable tasks. This is especially true in the enterprise, where solutions are hard to generalize. This was easily one of the most exciting insights from my perspective. That is to say, even though the big boys are making big bets in this space, they will essentially still be reliant on individual bots (point solutions) to accomplish specific tasks. That means that there is huge value in individuals, startups and enterprises building the specific bots they need to accomplish specific tasks. Assistants won’t be in a position to deliver this value any time soon. Start building!! Keep building!! If you want to implement AI for your bot, you have lots of options. You can build your own (TensorFlow, Theano, etc), or you can make calls to existing services (LUIS, API.ai, Wit.ai, etc). This incremental approach makes a lot of sense, and keeps the team focused on what’s good for the user, rather than diving into the deep water of AI right at the outset. But your data is more important than the AI implementation you choose. Pay special attention to “Need to acquire more costly training data”. This is a non-trivial detail. The best AI algorithm in the world is only as good as the data it has access to. If you need proof of this, consider that tech giants are open-sourcing their algorithms all over the place (e.g. TensorFlow, OpenAI, etc). But NONE of them are open-sourcing their data sets. 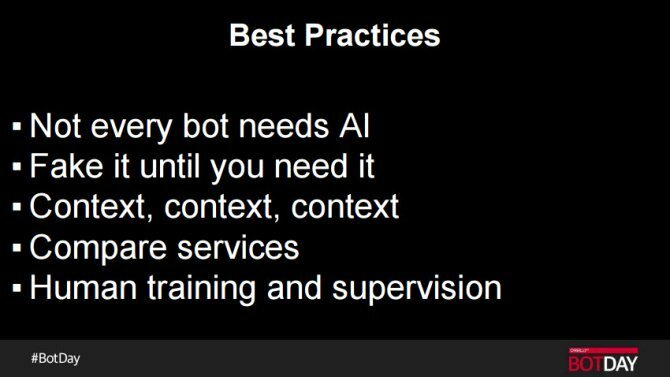 To make any AI algo you choose work well, it has to be trained. Training takes TONS of data, and that data is hard to acquire at scale. Make sure that whatever solution you choose, you’re always retaining your own proprietary user data. That’s what will deliver value to your bot and your company over the long term. Andy from Automat put together a great overview of the some of the key UX considerations for bot interactions. He also dove into some of the most interesting platforms, looking at what their offerings were. Download his deck – it’s worth the read – but I won’t attempt to summarize it here. His point was that the simple act of reading through a dialog flow or interaction with another human being is tremendously valuable. You will might realize, for example, that you’re relying on users to say the word “refine” when they want to make their query more specific, and no human being will use that word naturally. 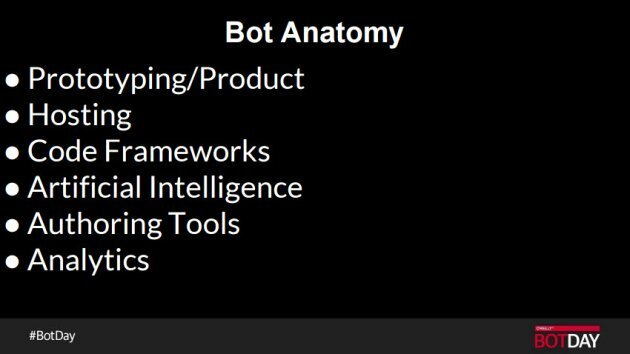 Analytics and understanding what your users are doing is the most important thing in bots today. There is no “uninstall” metric for you to monitor – users just abandon your service. Without diving into your server logs, you don’t know anything. My favorite session of the day was from Joshua Browder. Joshua is a 19-year-old developer from the UK, and he’s done something pretty remarkable. He realized that the justice system has some inherent injustice built in – 80% of people who need legal help in the UK can’t afford it. Josh wanted to see if he could fix that, at least in part. His solution was to build a bot that automated the creation of the legal document necessary to contest a parking ticket. The bot leads a visitor through a dialog, the user answers questions, and at the end they get a correctly formatted letter they can mail to the parking enforcement division. Josh went on to talk about how he’s building out the bot to automate other legal services, such as filing the paperwork necessary for a homeless person to request housing support. He’s building another solution to help Syrian refugees with immigration. It was a pretty stark and humbling thing to see a single teenager talking about how he’s using bots to change people’s lives. Lili Cheng from Microsoft AI + Research closed out the day talking about some of the large-scale experiments Microsoft has been running related to bots. 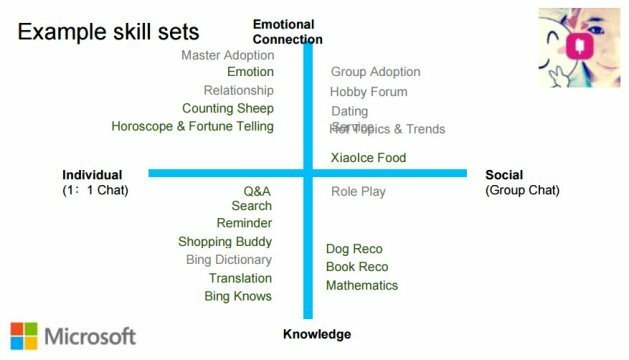 The one she spent the most time on was XiaoIce, which started off as a true “chat bot”. All it did was carry on conversations with people. It was launched during a hackathon, where the challenge was to make a “fun and engaging” bot. It was launched on WeChat in May 2014, and within 72 hours had 10 million users!! WeChat shut it off, and Microsoft used that time to improve the bot, and adapt it for more platforms. It was time well spent. Lili went on to cover a lot of ground related to how XiaoIce is maturing, and the trends she sees for bots in society. Overall, her message was a very positive one – build stuff, put it in front of real people, and keep refining it. You never know what people will respond to. From my perspective, Bot Day was a huge success. The exposure to big companies (Microsoft, Slack, etc) was a great contrast to my personal experience, which skews much smaller (individual developers, startups). Overall, the main takeaway for me was how complimentary these two groups are. The big companies have a huge lead in core AI, computing power, and massive data. But smaller players, all the way down to individuals, are driving the technology into niches where users are getting real value. Having a bot play your music for you is neat, but it’s not a very differentiated offering. Having a bot that’ll fight parking tickets for me – now THAT’S something I’m interested in. 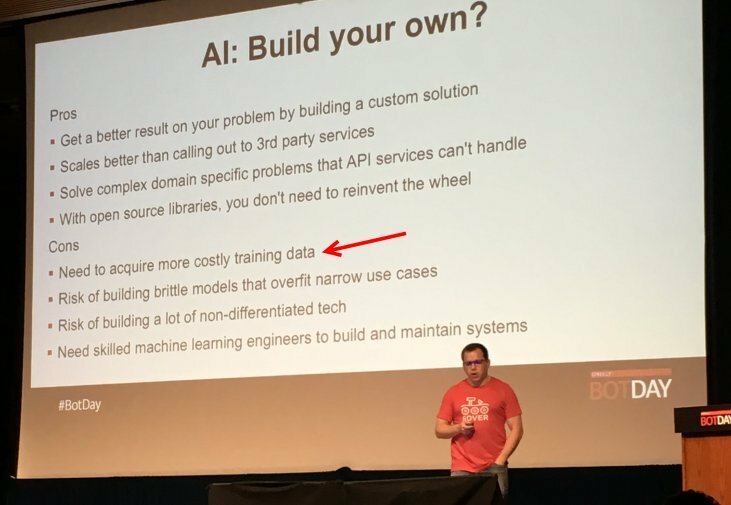 Bot Day was a great experience as an attendee, and carried a strong message – Start building!! Keep building!! What Are Search Engines Telling People About Bots? Where in the World Are People Searching for Bots?